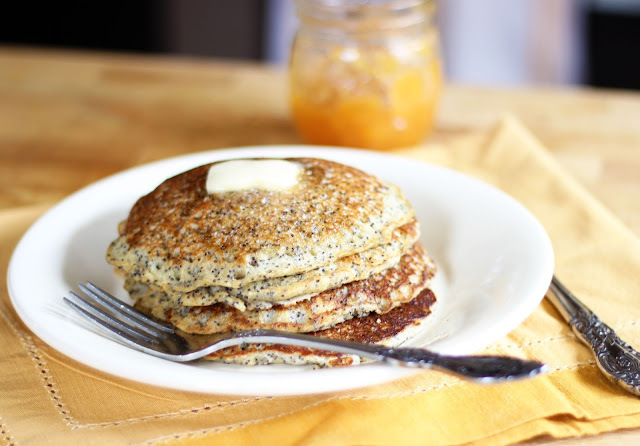 The combination of lemon and poppy seeds is such a classic. And somehow, it makes every recipe it touches just a little bit better. Or maybe it's the crunch of the poppy seeds. Either way, it's a combination made in heaven. These pancakes capture everything that's great about lemon poppy seed muffins or cake -- and bring it all to the breakfast table. They're tender and light, and if you use a bit of butter to cook them, you'll get those amazing ever-so-slightly crisp edges. Most recipes for lemon poppy seed pancakes call for buttermilk. But you shouldn't worry if you don't have any on hand -- since you're using lemon juice in the recipe, you can just use regular milk for the pancakes, and everything will come out just fine (after all, you can make buttermilk substitute by mixing a bit of lemon juice with milk...). And, while these pancakes are great with maple syrup, they really shine when matched with peach jam -- something I found out this morning when we whipped up a batch for breakfast. the freezer for smoothies. 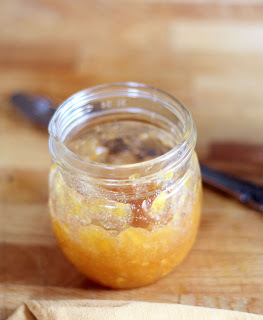 But, I also managed to preserve about half of them -- in the form of peach mostarda and rosemary peach jam. 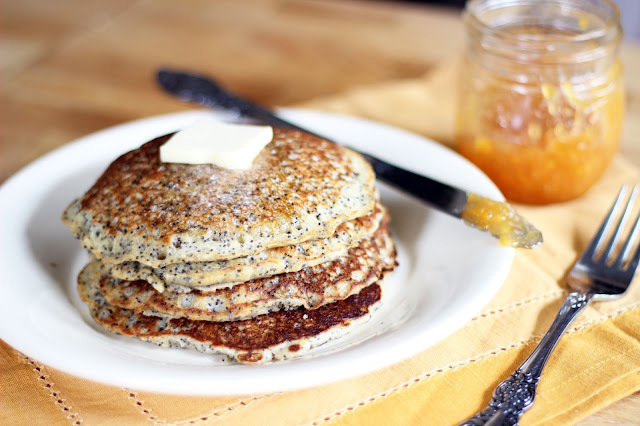 The rosemary peach jam was a stellar match for these pancakes, which are redolent with lemon flavor and crunchy poppyseeds. Orange might be a nice twist, if that's more up your alley! Nice ... ! Is it suitable for breakfast?